We’re still perfecting this recipe, but so far we like the results. My husband spent a number of years in Ohio, and he thinks this is pretty darn good. The first time I tasted a Cincinnati style chili, I was ecstatic. It tasted exactly like the hot dog chili we used to get at the Roanoke Market when I was a little girl. I guess that hot dog vendor must have spent some time in Ohio. You need to allow 3-1/2 to 4 hours to make the chili. If possible, make it the day before and then warm it up (it’s even better that way). Or if you are absolutely craving a 5-Way, use a very lean beef and make it the same day, just make sure you start early. Remember, the cheese always goes on top, unless you want to have it inverted with the cheese on the bottom and the spaghetti on top. 3-Way: On top of spaghetti smothered with cheese. 4-Way: On top of spaghetti smothered with onions or beans and cheese. 5-Way: On top of spaghetti smothered with onions, beans, and cheese. On hot dogs, topped with cheese and onions. We use very lean beef and think that it works well. It produces very little fat in the chili, and is good for those times that you can’t plan ahead and want the chili on the day you make it. If you use 80% or 85% lean beef, then make the chili a day ahead and refrigerate overnight so that you can easily skim the fat off the top before reheating. 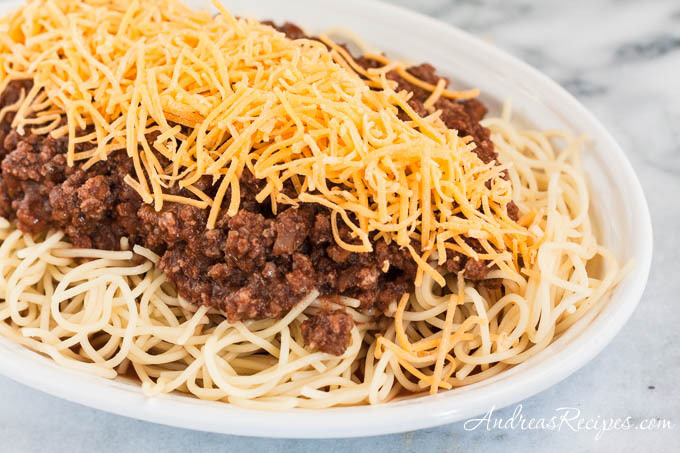 There are many, many variations on Cincinnati Style Chili. We’ve seen versions that use cardammom instead of chocolate, no Worcestershire sauce, more or less cinnamon, no bay leaf, and even some that brown the meat first. So if you use a different variant and want to share your ideas on Cincinnati Style Chili, feel free! In a 4 quart sauce pot, add ground beef and water. Cook and stir until beef separates to a fine texture. Use a potato masher to mash the beef to a fine texture. Boil slowly for 30 minutes. Add all other ingredients. Stir to blend, bringing to a boil; reduce heat and simmer uncovered for about 3 hours. You want the chili to cook down, but not too much. If the chili starts to gets too thick, you may want to cover it during the last hour to bring up the liquid content. During the last 30 minutes cook the spaghetti, the hot dogs, and the kidney beans. I am going to try this over the weekend.